Enlarge CLIO Pocket is Audiomatica's new Electro-Acoustical Multi-Platform Personal measurement system. The system comes complete of the CLIO Pocket software (Windows and OSX native), the CLIO CP-01 Audio Interface hardware, and accessories. 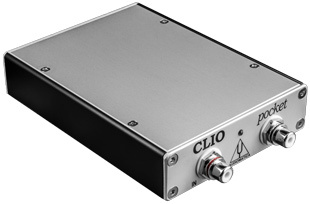 CLIO Pocket is a powerful, rugged and lightweight portable measurement system. The CLIO CP-01 audio interface running the CLIO Pocket software can be installed in any personal computer with the following system specs: - Pentium IV class processor (suggested minimum 2GHz) - One free USB 2.0 port - 1024x786 video adapter - Microsoft Windows (XP, Vista, 7, 8, 8.1) or Apple Mac OSX (10.5 to 10.10).